*TN LCOS devices show a contrast in CFS mode >1000:1 using compensators like trim retarders or QWP´s, whereas in monochrome applications the sequential contrast could be above 3000:1, even higher with VAN-type LCOS in normally black mode also with compensator optics. 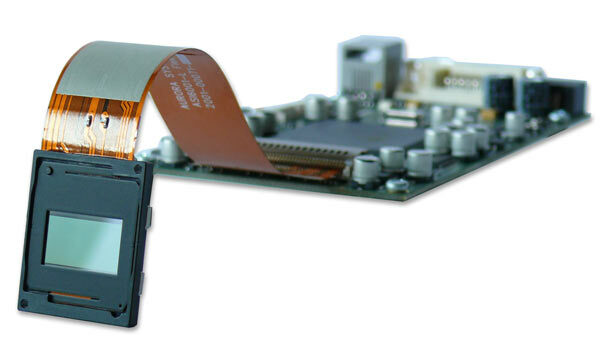 For the HED 6001 microdisplay we offer a developer kit (HEO 6001-SC-II) including display, driveboard and all necessary accessories to run the display for testing and evaluation. The signal is addressed via a standard DVI (Digital Visual Interface) signal e.g. by a PC’s graphics card. Basically, the LCOS display works like an extended monitor. Hence this plug and play kit guaranties a quick start-up and easy usage. The kit is highly programmable and allows a tailored configuration according the specific requirements. Via the RS-232 interface and with the provided software one is able to perform gamma control to configure the modulator for different applications and wavelengths. Besides geometry and gamma corrections different sequences can also be addressed to the driver.